Afghanistan 474 (Noori 85, Shahzad 88, White 4-99) and 137 for 3 (Ali 57) beat Ireland 405 (Porterfield 78, Shenwari 4-75) and 202 (Johnson 63*, Ahmadzai 5-52, Nabi 4-33) by seven wickets. Afghanistan pulled off their second win in the Intercontinental Cup, defeating defending champions Ireland by seven wickets to propel themselves to the top of the table. Both teams had talked before the game about the respect they had for each other and in a fluctuating contest, Afghanistan grabbed the initiative to drive home a victory that would have seemed unlikely when Ireland began the final day 39 runs behind with all their second-innings wickets intact. 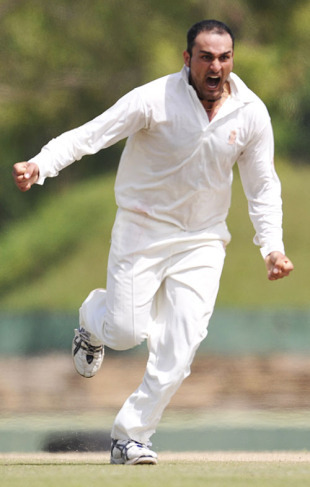 Paceman Dawlat Ahmadzai proved the difference as he burst through the top order on his way to his maiden five-wicket haul. He struck in the third over of the day to remove a becalmed William Porterfield caught behind for 14 before castling Andrew Cusack in his next over for 4. By the time he bowled Gary Wilson for 27, Ireland were tottering on 57 for three. Offspinner Mohammad Nabi (4 for 33) then stepped into the action, taking three quick wickets with probing, accurate bowling to reduce Ireland to 101 for seven. Some lust hitting from Trent Johnson and diligent blocking John Mooney, who made 18 from 76 balls, carried the score up to 141 before a final wicket stand of 59 between Johnson and Peter Connell took the score to 202. Johnson ended up unbeaten on 63 to leave Afghanistan with 137 to get. An early wicket for Johnson gave Ireland a sliver but a half century from Noor Ali and a 36-run partnership from wickkeeper Mohammad Shahzad and captain Nowroz Mengal guided Afghanistan home. It's a remarkable result for Afghanistan who's continued progress in international cricket has been one of the most cheering aspects of the game in recent months.